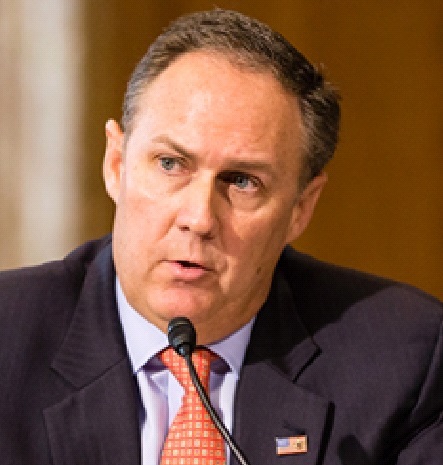 The FERC building in Washington D.C.
Robert Powelson, a commissioner for the Federal Energy Regulatory Commission, announced in a tweet Thursday he plans to step down from the agency in August to become president and CEO of the National Association of Water Companies. Powelson has spent less than a year in his role at the helm of the powerful federal regulatory body, which oversees the nation’s power grid and natural gas transmission lines. The Republican was appointed as a regulator to the Pennsylvania Public Utility Commission in 2008 and held that position until last year, when President Trump nominated him to FERC. Powelson has been an outspoken supporter for the opportunities the natural gas boom has created, and his advocacy has irked many pipeline opponents. He also argued forcefully against the Trump administration’s efforts to prop up struggling coal and nuclear plants and believes those efforts would seriously disrupt competitive markets.